Foot Spa Gift Pack. All items come packaged in a clear, reusable vinyl bag with zip slider. Standard pricing includes custom imprint on vinyl bag. 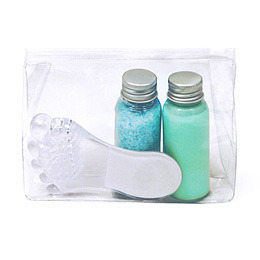 Pack Contents: 50ml soothing peppermint foot lotion, 50ml bottle of reviving foot soak, 1 clear acrylic foot brush.